With mice, the software suite doesn't really need to be too complicated, and a lot of companies have perfected their engines well. Cougar has managed to get the hardware right, so hopefully it hasn't gone too crazy with the software. 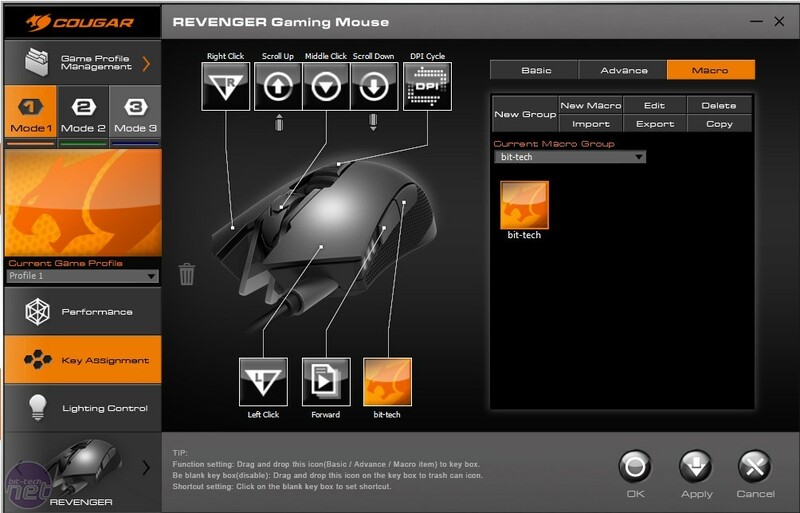 Opening up the Cougar UIX system brings up the mouse settings. Here you can set the stages you wish the DPI button to switch between as well as changing many other options such as scroll speed and polling rate. It is great to see this screen as the first one as it really is the most important one. 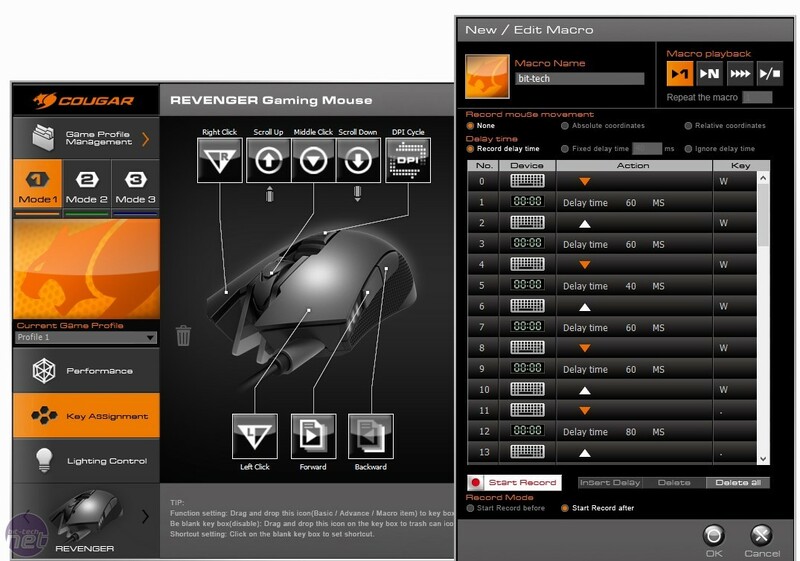 With the multiple profiles available, you can also set it up to have completely different settings depending on how you choose to use the mouse. 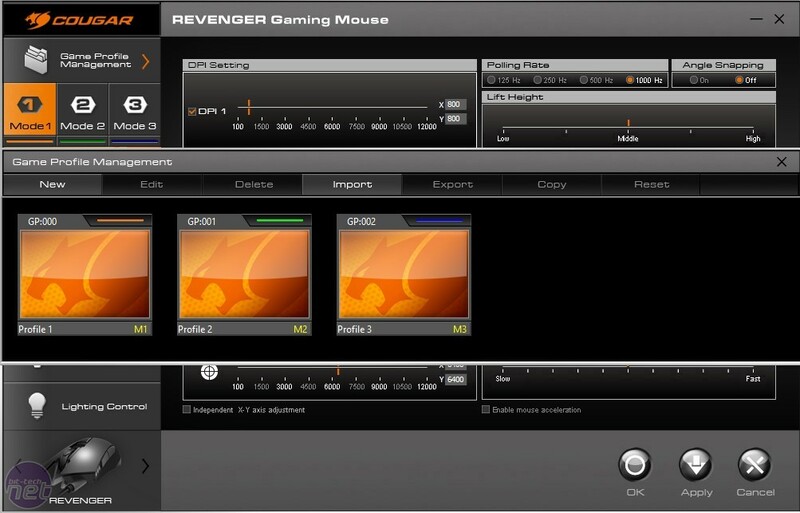 All of the buttons on the Cougar Revenger can be programmed to do a whole host of commands if you don't want the standard options. 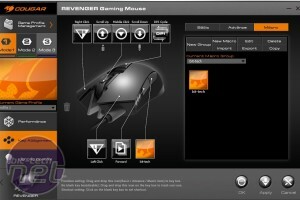 You can set the buttons to launch programs, control media, and also launch macros. 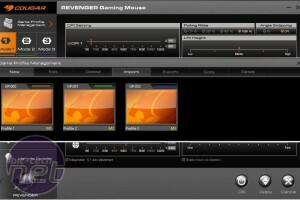 Macros are easily recorded, and the recording feature is very impressive; you have all the options you'll need and more such as recording mouse movements, setting delay times, recording keyboard strokes, and setting repeat options. To set a macro to one of your buttons, simply drag and drop it into the box and click apply. 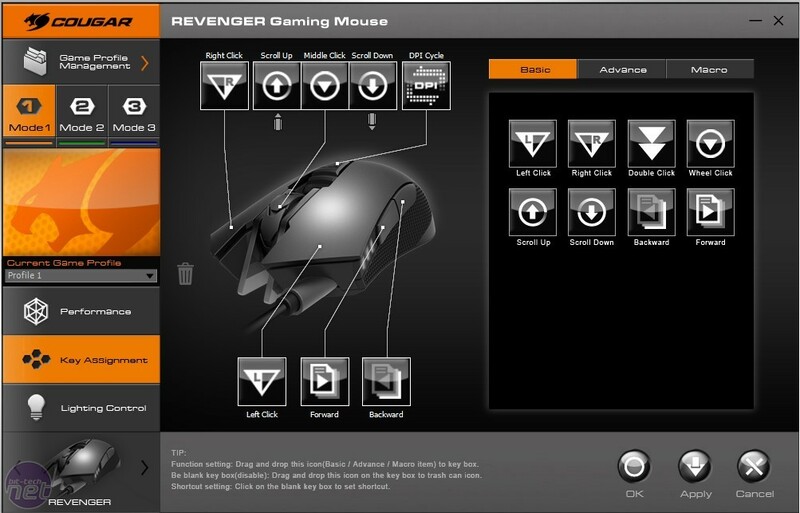 It is not often that we wish a mouse had more buttons, as usually they are not needed, but we found that with the Revenger, a few more buttons would have been great simply to launch more macros. 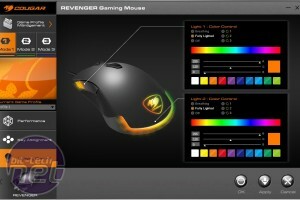 I tried the mouse with a few different games, and I have never used macros so much; the software just made it easy. Lighting options are somewhat limited, but what we do have works well, and in all honesty we think it is perfectly fine: You still have plenty of control over the LEDs and the way the colours fade into each other looks great. I tend to be quite boring when it comes to LED colours and options with mice, usually just either turning the LEDs off or setting them to a static single colour, but I must admit that with the Revenger I did like the way the colours switched, so I left it on one of its dynamic modes. 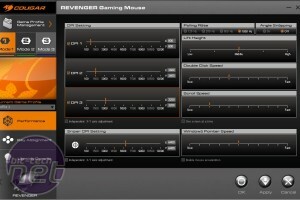 Cougar has done an excellent job with the Revenger. 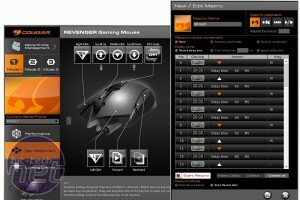 There are not many things that bugged us, but as always mice are very subjective, and we have to think about what other users will like and want from their mouse. 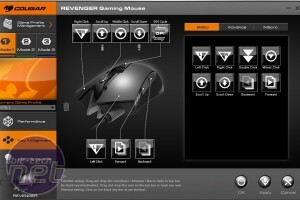 One slight issue for some people will be the weight; a lot of gamers do prefer lighter mice, as this allows them to "flick" easier, but the Revenger is a little bit heavy. The plastic shell combined with the rubber, anti-slip flanks really gave the mouse a comfortable feel with palm and fingertip, but I personally felt that the mouse was a little bit wide for a claw grip. I do have small hands, however, so it might be perfect for others. Performance wise, it did slip a little bit when the DPI was set to 12,000. We can't rebuke the mouse too much for this though, as the chance of needing 12,000 DPI for anything that would require it to be perfectly accurate are very slim, and the stutter really was minor. 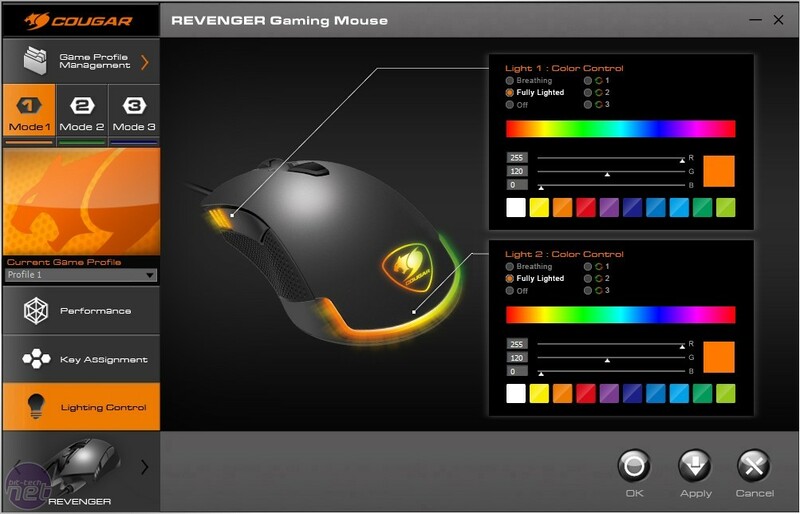 The lighting options also could have been more complete, but again, it doesn't take anything away from the quality or functionality of the mouse, and we would rather see less options if it means quality over quantity. The options available look great, so there is no need for too many. As you can tell, we had a very positive experience with the Cougar Revenger. The price is reasonable, especially for one that boasts a PMW3360, has great build quality, is comfortable, and has a software suite that matches the standard of the hardware. 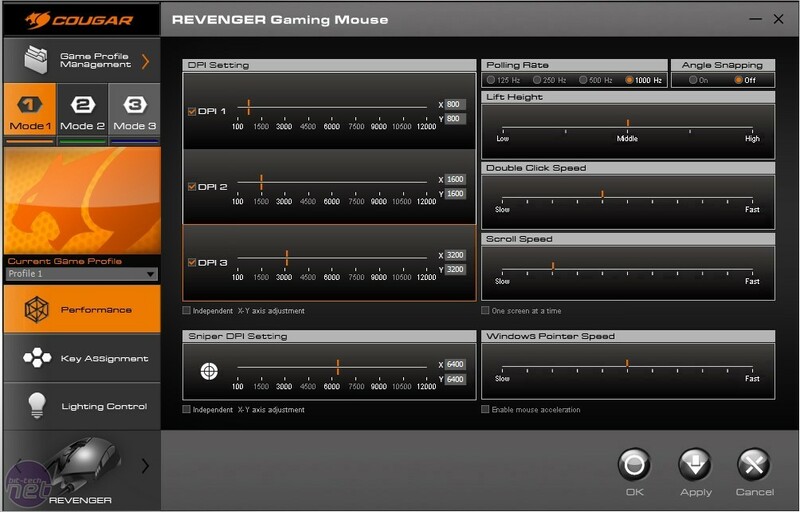 We have been happily surprised by the Cougar Revenger, and we would highly recommend it to those who are looking for a new mouse with a bit of weight behind it.